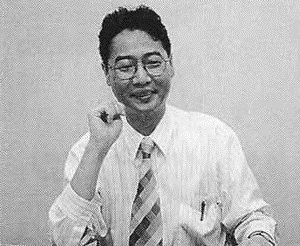 Toshiyuki Nakai was a planner and designer at SNK from 1983-1987. After that he switched to promotion and marketing, and helped design the look of the new Neo Geo hardware. In this interview from Neo Geo Freak magazine, Nakai looks back at some of the highlights of those early days, including anecdotes from the development of Athena, Psycho Soldier, and Beast Busters. He then talks about the marketing and design of the Neo Geo, with some funny remarks about the system’s early mascot, G-Mantle. 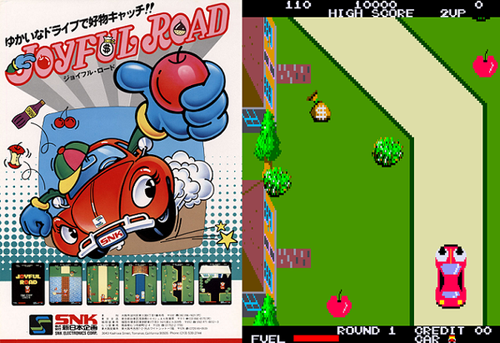 At that time (1983), they were in the middle of developing Joyful Road for the arcade. That was my first work, too, designing those sprites. The designs for the player character (a car) and the other main characters had already been completed. I remember creating the other minor characters and sprites: patrol cars, fire trucks, etc. Back then we were limited to 8 colors per sprite, but unlike today we had no helpful software development tools. We had to draw all the sprites by hand, using vertical graph paper and felt pens. After that, they had to be programmed in, which meant converting all these drawings on graph paper to numerical form for the computer. If I recall, we also had to convert hexadecimal to binary, but it’s all been so long now that I’ve forgotten the details. (laughs) Finally, we handed the data we’d converted over to the programmers, who would then input everything and make it all appear on screen. But I was shocked when, several days later the programmers showed us the actual graphics on-screen. Since I had no prior experience doing calculations in hexadecimal, there were mistakes everywhere! And the design of the characters, once I saw them on-screen, didn’t look very good either… it was sad. I had to re-do my calculations and revise the sprites, but what had taken me only 30 minutes to draw on graph paper with a felt pen (I thought I was some kind of prodigy, hah!) now took an entire day to laboriously revise. When we develop games today, we work in multiple discrete teams, and you don’t really know how things are going for the team in the next room. But it was different in those early days. We only released 3-4 games a year then, and the developments themselves used fewer people, so in general everyone worked on every game. One person would be appointed as a team leader of sorts, but the same person might also work as a planner, graphic designer, and even compose music if they had to. It was an amazing time. Starting in 1985, with TANK and ASO (Alpha Mission), the way we developed games changed to something closer to how we work today, with individual teams. 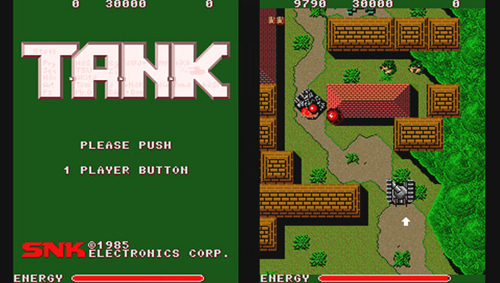 By the way, I was the main background designer for TANK. We also started using specialized graphic tools at this time: no more drawing on graph paper! Now you sat at a monitor and used a keyboard to change colors and so forth. Again, it’s very close to how we do things today. I can still remember what a relief it was switching to those new systems… it was so much easier than before! Regarding ASO, I worked with another planner on the entire project, beginning to end. It was my first “complete” game development, so I remember it well. RPGs had just started to become popular in the overseas market, so when we were planning ASO someone suggested we try including some of the same gameplay mechanics. 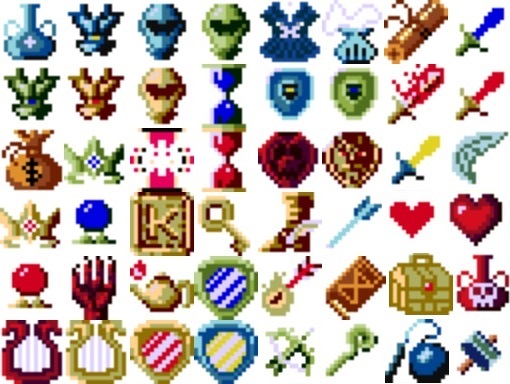 That gave us the hint we needed for the system in ASO, where you collect different items and power up your ship. With the basic plans decided, it was time to get to work on the actual game. 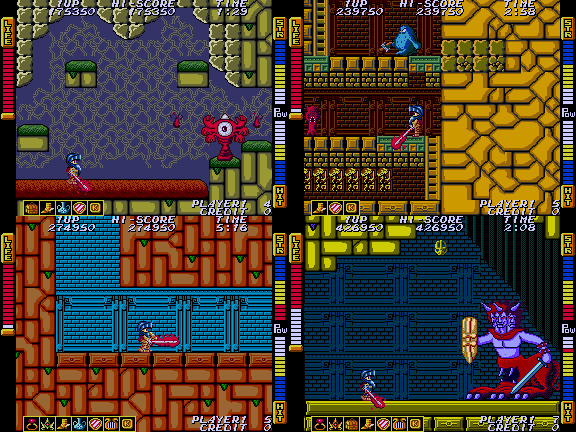 I worked on background and enemy design, and even today I remember how busy I was then trying to juggle everything. Developing Athena was an unforgettable experience for me. I drew Athena herself and most of the other characters, so besides its popularity, it left a big impression on me.Athena was thought up by the same person who did the planning for ASO, and he again proposed that we create an action game with RPG elements. We liked his idea, and worked Athena into a game where you collect equipment and items as you progress through platformer stages. an attempt to ride the wave of RPG mania. There were differing opinions about the matter, but we also decided to use a female protagonist for our game, which was rare at the time. As we worked on the gameplay system for Athena, I remember us talking about how this was going to be a fun, lighthearted fantasy game: up until then, we had mainly done more “hard” and realistic settings like TANK and Ikari Warriors. In any event, I worked really hard on the graphics for Athena. As you can imagine, now that our developments were more team-based, a healthy sense of competition and rivalry developed between us. I didn’t want to be the weakest link, and slack off in my art. I really gave the drawings my all on that game. We also received a bunch of fan letters sent to Athena, the game character, herself. Also lots of postcards with illustrations on them. It probably doesn’t seem rare at all today, but back then it was very new, and I remember everyone at SNK was surprised. As her character designer, it was a huge encouragement to me, and made me very happy. In an instant, all the exhaustion and pain I felt dissipated. Athena wielding the Fire Sword. The following year, alongside the Famicom port of Athena, we released the arcade sequel Psycho Soldier. Around this time I actually moved away from hands-on development and more into promotion work, but I still worked very closely with the developers on-site. The Psycho Soldier development was headed by the same planner who had created Athena. He decided to change the proportion of the character sprites so they were less deformed. As such, Athena feels a little more grown-up this game. Psycho Soldier became famous as the “singing video game,” but the truth is, we had used speech synthesis long before that, in a number of different games: the side-scrolling STG Vanguard from 1980, then in Fantasy in 1981, and again in Victory Road (the Ikari Warriors sequel) in 1986. This time someone proposed “let’s have singing in this game!”, and the game turned into this very weird thing where the heroine sings while she fights… We had idol Kaori Shimizu sing the song for us. I remember putting her face on the advertisements we created for Psycho Soldier. an “original music tape” of the Psycho Soldier theme sung by Kaori Shimizu. Whoops… that digression took us way back into the past. It just came to me all of a sudden—I’ve got so many memories of those days! After Psycho Soldier we released a number of different games, including some sports games, but the arcade game that left a big impression on me was Beast Busters, that weird little game from 1989. It was a shooting game in which you use a lightgun to destroy the attacking zombie hordes. I believe it had a really long run in arcades, so a lot of people had a chance to play it, I think? The biggest struggle in developing Beast Busters was getting the scaled graphics to look good. Being a pseudo-3D game, we wanted to make players feel like the enemies were getting closer and closer, but we didn’t really have adequate sprite zooming functionality, so it was a lot of difficult work to get them looking right. We ended up making multiple sprites for every character: at small, mid, and close-up distances. Luckily we found a way to seam the graphics between those distances, and I think it came out really nicely. 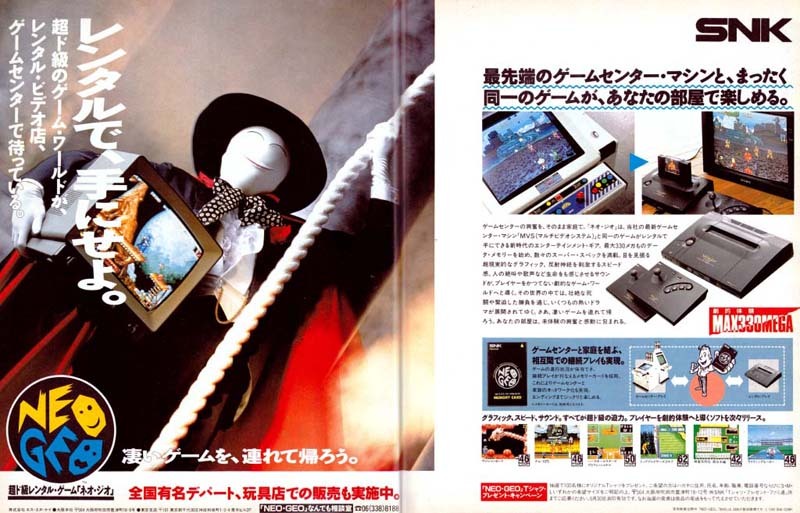 Early promotional ads for Neo Geo hardware rentals, featuring the G-Mantle mascot character. In 1990, the Neo Geo was finally released. By this time I was no longer doing any development work (and hadn’t for awhile). Those were very busy days. I was helping design the exterior of the Neo Geo hardware, as well as creating promotional materials. SNK’s plan was to start with hardware rentals, as a way to ease into the home console market. I remember making the special bag that carried the hardware and equipment, and creating a promotional list of the available software. I also worked on various parts of the exterior hardware design. Our earliest design concept was, “let’s make something that looks COOL!” Many game consoles from that time had a rather childish, toy-like design. We wanted to create something no one had seen before, a console with a hi-fi/luxury feel. For that, one question that quickly arose was the color. Nowadays there’s a lot of A/V hardware with a metallic color scheme, but back then black was overwhelmingly the most common color. Hence we chose black for the Neo Geo, so it wouldn’t look weird lined up next to owners’ other AV equipment. By the way, between you and me, cost-wise black was also the cheapest color to use, and that was also a reason (but not the reason, mind you). After that, as you all know, we had our big breakthrough with the 100 MEGASHOCK fighting game releases everyone is now familiar with. Which brings us up to the present. Thank you for reading, and please continue to support the Neo Geo!